LondonJazz News: You are involved in the BBC Symphony Orchestra's Richard Rodney Bennett Total Immersion. What will you be doing? 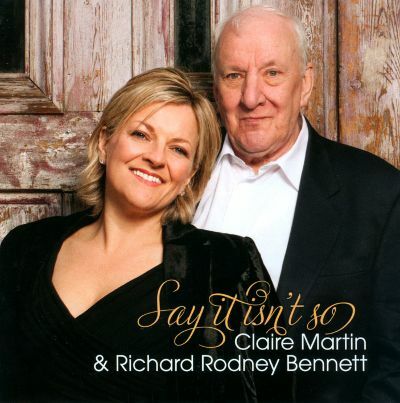 Claire Martin: I am very honoured to be a small part of this celebration of Richard’s music. I’ll be singing four brand new arrangements of his songs by the brilliant conductor Scott Dunn who was also a dear friend of Richard’s. Very special for both of us. The four songs are: Early to Bed, I Never Went Away, Goodbye for Now and Let’s Go Live in the Country. All very different and I’m very much looking forward to doing them. LJN: What other events in the weekend grab your attention / have particular resonances for you? CM: Well I especially love Partita which I think is the piece they are playing before my songs, let’s hope I can hold it together as I find it deeply moving. Richard could write very romantically without schmaltz or gushing. He wore his genius very lightly and seemed to be able to turn his hand to many styles of music. The whole day reflects this very well. LJN: You worked with RRB for several years - how did you first meet? CM: Richard was in Glasgow in the early 1990’s to see the concert hall space where he was to perform in, and I, quite by chance, was singing that night with my trio in the function suite within the concert hall. We met at the bar after my set and that was it. We hit it off immediately and it was without a doubt one of the luckiest nights of my life as I also met Elliot Meadow that night and he introduced me to Linn Records and produced my first record for them which Richard wrote the liner notes for. It was just one of those lucky nights!! LJN: And when did you first work together? CM: I used to sit in with Richard whenever he was in London or if I was in New York, but we really became a proper partnership around 2001. I remember being pregnant with my daughter during our first rehearsals and both of us eating far too many doughnuts. He was a lover of cooking and good food and was a very good cook, but he also loved junk food and his favourite sweets were Bassett’s Jelly Babies which we ate by the bag full on every road trip. CM: Our residencies in the Oak Room at the Algonquin Hotel in NYC were real highlights for me as it was all SO New York and dead glamourous. Plus we stayed in suites at the Algonquin, so it was a very easy trip down in the lift each night for our shows. Luxury!!! But honestly - every gig with Richard was a gem as he was so easy to work with and I learnt so much just being around him hearing him talk about music to me or whoever we happened to be with. He was a consummate professional who took rehearsing very seriously and then on stage was playful and totally up for a laugh. We had lots of ‘in jokes’ between us on stage, a look or a lyric might send us into hysterics, but we had to keep a straight face. Singing with Richard was a joy and I was always aware just how great a musician he was and how lucky I was to be sharing the stage with such a giant. LJN: How did it happen that he knew the jazz standards repertoire so well? CM: Well he grew up listening to and loving all the great writers, Arlen, Berlin, Gershwin, Porter etc, and loved all the jazz singers that sung the songs, especially Carmen McRae (who was his favourite), Shirley Horn and Chris Conner. He knew a lot about songs, every obscure verse, every writer, what year the song was written and usually the publisher too. I don’t know how he remembered all that plus all the ‘classical’ stuff as well. A big brain!! LJN: He seemed as a musician to have a particular way of crossing into different styles, suddenly being somewhere else musically. Did he ever talk about that? CM: Not really, he just seemed to be able to seamlessly go from one thing to another in his stride. He never really wanted to talk about his classical music, I think most likely because he knew I would have been totally out of my depth and was perhaps not the right person to talk about who was composing what etc. He had a great friendship with the composer Mark Anthony Turnage and I think that they would have been having far different conversations to the ones we had!! LJN: He always seemed a kind and generous person? CM: Richard was a true friend. He was fiercely loyal, terrifically supportive and incredibly giving. He also had a GREAT sense of humour and was mischievous and slightly wicked. I miss laughing with him the most. CM: He was very happy at that school and the whole Quaker ethos suited him, especially after a rough time at an early age at a boarding school where bullying was rife. I think he did want to see the good in others and he treated everyone he met with good manners and kindness. However, he did NOT suffer fools! LJN: Was he patient - or were there things that made him impatient? CM: I only saw Richard lose his temper once during a particularly agonising sound check with a young and rather rude and stupid engineer, but other than that he always seemed very calm and nothing really phased him. He was incredibly optimistic about everything and not inclined to hang out with negative people. He knew himself, had nothing to prove and just enjoyed his life from day to day. A true Renaissance man I am so honoured to have been part of his world singing songs we both loved, eating Jelly Babies and laughing our way up and down the M1.